This frame fell off the wall due to cord failure. This resulted in the glass breaking and one of the frame mitres failing as shown here. Fortunately in this case, the artwork was not cut by the breaking glass. Frames often come in for repair due to picture cords failing. Ideally pictures should be checked once a year to ensure they look secure. 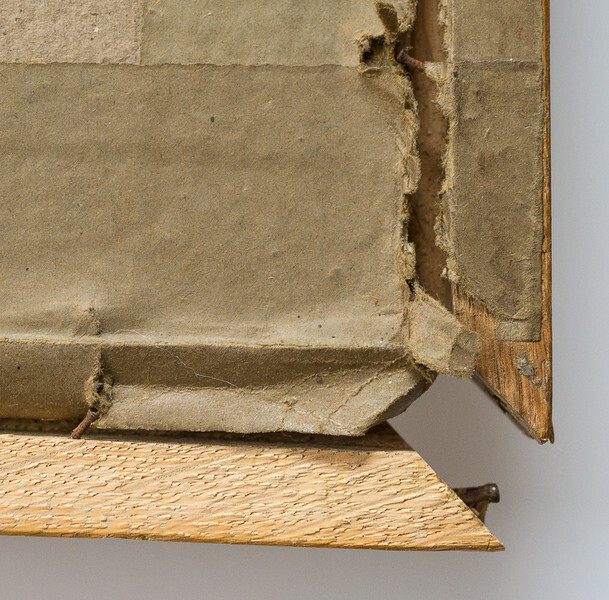 Notice the protruding nails at the broken corner of the frame. This is how frame mitres used to be joined but now they are underpinned. Underpinning is a better way due to there being no visble signs of how the frame is joined.